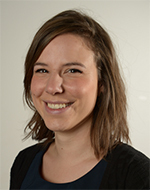 Elien Danckaerts is innovation manager at Flanders’ FOOD since 2015. Flanders’ FOOD is the innovation platform for the agrofood industry, established by the food industry and supported by the Flemish Government. Flanders’ FOOD supports companies to strengthen their competitive position through innovation. This by bringing together companies, government and knowledge centers (universities, institutes of higher education and other centers) in a national and international network. Through this network Flanders’ FOOD provides an answer to scientific and technological needs and opportunities of the food industry. Elien has a masterdegree in BioScience Engineering (Food Technology). Currently, she is involved in SeaConomy, a Flemish project in which barriers to local cultivation, biorefining and marketing of seaweed products are tackled.